I took a stab at answering the question What is Web 2.0? in an essay I wrote for distribution at our Web 2.0 Conference. The essay will disappoint those who look for a hard and fast definition, because I tend to think about the gravitational core that holds a solar system of ideas and experiences together, rather than some kind of box to contain them. But hopefully, it’s a useful contribution. If I had to pick out one of the principles that I highlight as the most significant addition to my thinking on the subject, it would be this: Web 2.0 is about systems that harness collective intelligence. P.S. Interestingly, the fact that I’m using Flickr for figures in my writing these days led to a leak of one part of the essay before the piece as a whole was published. 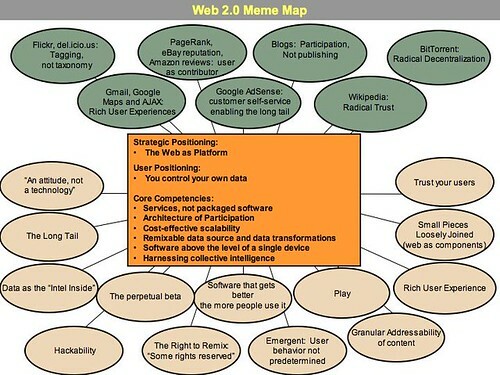 I posted a “Web 2.0 meme map” to flickr so I could reference it from there in the article. I thought I’d get the article up before anyone noticed it, but I was surprised to see Business Week pick it up last week.